With the Belt and Road initiative and increasingly strong ties with Africa, China has strived to tell a good story about itself in the continent. However, despite the large investment by Chinese media outlets in Africa, building a good image for the Chinese people there is not always easy. "The Chinese always say China-Africa is win-win cooperation and we are brothers. I don't know whether it is win-win, and who are the 'brothers' they talk about, maybe our government officials?" said John Bailey, a South African reporter who has been covering China-Africa relations for many years, during the Africa-China Reporting Project workshop organized by Wits University in Johannesburg that we attended recently. 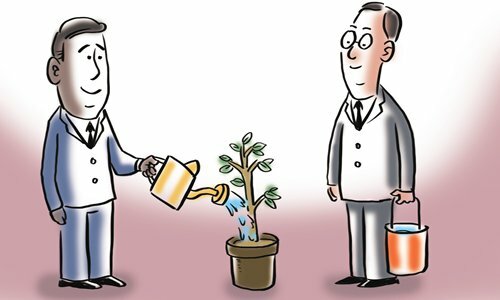 Over the past few years, we have been seeing how misunderstandings and a lack of communication have caused more and more social and environmental strains in the area of China-Africa relations. Illegal trade in ivory and rhino horn, environmental destruction, labor disputes, money laundering and so on have got the Chinese embroiled in intensive conflicts in Ghana, Zambia, Namibia and South Africa, which China views as "good friends and partners." Chinese communities in Africa often feel "hurt" when they see their country's image being sullied, but blaming African media may not be the solution. So what is really missing in China's effort in telling a good China story in Africa? "They try to give what they want, but do not conduct research to understand what people need," said Sharon Tshipa, a Botswana journalist sharing her findings in a story about Chinese Corporate Social Responsibility in South Africa. In her interviews, she found many Chinese donated things to local orphanages not realizing those items were not needed. As Tshipa rightly pointed out, many Chinese companies in Africa have tried to do good things, out of both public relations and their sincere wishes to help. However, the companies usually know very little about the community, and therefore what they give may not be what is needed. Wildlife conservation is another case of how Chinese in Africa do not know what is best to give. Chinese embassies and companies have donated a lot of funds and material to African wildlife conservation, especially to government agencies, and held lavish donation ceremonies. However, this is rarely known among African and international conservation communities, let alone being received well. What might be needed by local and international communities for wildlife conservation is indeed not just money, but an attitude and positive engagement by the Chinese community regarding the hot button issues like illegal wildlife trade in which some Chinese people are involved. Throughout the workshop, we participated in wildlife conservation petition activities co-led by Chinese business communities in South Africa. This project tells us how wildlife conservation could be undertaken by the Chinese in a different way. As far as the rhino horn trade legalization controversy is concerned, this campaign aims at mobilizing Chinese in South Africa and promoting "we do not buy." Wildlife conservation NGOs in South Africa are indeed happy to see and hear the Chinese community act, compared to its donations. Apart from not understanding what is needed by NGOs and communities, not realizing what the media needs is also a top challenge for telling the China story in Africa. Even today, many Chinese company leaders in Africa do not know "propaganda" is a negative term in English. Apart from evoking ridicule, this "propaganda" mind-set is creating challenges in interaction with African and international media, which complain they have a hard time getting interviews and good quotes from Chinese companies, even when they are reporting about positive moves of the Chinese in Africa, such as Chinese companies fulfilling their Corporate Social Responsibility. Most of the time, Chinese companies in Africa need approval from their domestic superiors about what they could say to the media. They also wish to control what the media would write about them. However, in Africa, media does not work this way: the companies' "propaganda speech" would rarely make for good quotes in their stories, and they will not agree to write exactly as the companies wish. Due to cultural and social differences, it might be quite some time before the Chinese community in Africa truly understands how to communicate with the continent's media. Perhaps, trying to gauge what African media and people think of us and want from us is the beginning point.